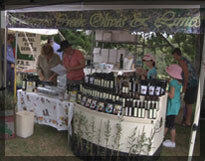 At the Watercress Creek Olive Festival, enjoy all that country hospitality has to offer. Watercress Creek Farm is only a short drive from Ipswich to the scenic district of Pine Mountain. View displays by the Rural Fire Brigade and meet the local volunteers who freely give up their time to assist those in need of emergency assistance. Relax on the lawn and enjoy refreshments and a gourmet burger from the Scouts. Listen to live music by a brass ensemble or a very talented young violinist under the shade of some of Ipswich's biggest and oldest trees. Experience the thrill of a helicopter ride and view from above the magnificent rolling hills and farming district of the Brisbane River Valley.